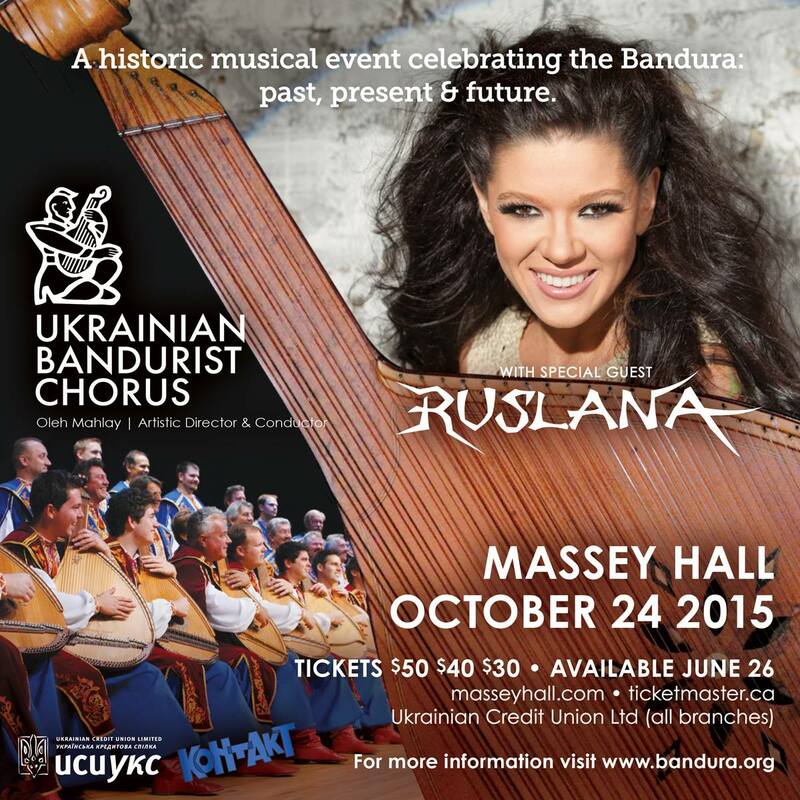 Red boots, sharavary, tattoos, leather pants… hmmmm… doesn’t sound like your typical Ukrainian concert, but that’s exactly what you’ll experience on October 24, 2015 when the Ukrainian Bandurist Chorus joins Ruslana at Massey Hall in Toronto. Coming up to their 100th anniversary, the Ukrainian Bandurist Chorus is a dynamic performing ensemble of vocalists and instrumentalists that are internationally renowned ambassadors of bandura music. The bandura is a stringed instrument, unique to the Ukrainian culture, which produces a sound similar to a harp. Played solo, it is enchanting, soulful, and captivating to listen to. But en masse, and accompanied by these powerful male voices – it is downright majestic. The bandura embodies centuries of Ukrainian tradition and history in each and every note, dating back to as far as the eleventh century when blind minstrels would sing heroic tales of kozaks and their quest for peace and freedom to the people of Ukraine. The Ukrainian Bandurist Chorus was one of the first organized bandura ensembles of the twentieth century. Established in 1918, seventeen men formed this ensemble during one of the most turbulent political times in Ukrainian history. The ensemble survived persecution, extradition from their homeland, even execution, in their determination to continue this tradition (the story of these incredible men can be seen in the film Music of Survival). Today, the ensemble is comprised of second- and third-generation Ukrainians from Canada and the US and it’s membership spans six decades of vocalists and instrumentalists. In contrast, Ruslana is a modern-day *R*O*C*K*S*T*A*R*. Although a classically trained musician, she won the Eurovision Song Contest in 2004 and instantly rose to international pop music fame with her album Dyki Tantsi (Wild Dances), which quickly went platinum and is still the best selling Ukrainian album to date. She is Ukraine’s most successful female solo artist, and has been awarded the highest honour of People’s Artist of Ukraine. She is also fiercely patriotic and is known for her social activism – her constant presence during the Euromaidan revolution in 2014 inspired throngs of Ukrainians in their determined quest for peace and freedom. Now what on earth do these two musical artists have in common? Their love for Ukraine, their passion for music, and their determination to continue the bandura‘s legacy. The Massey Hall concert will combine centuries-old traditional bandura music with Ruslana’s unique mix of pop and tradition, all centred around the majestic stringed instrument that is so often referred to as the voice of Ukraine. Sure to inspire even novice musicians, this historic concert is not to be missed and ptashka is so proud to be a partner of this event! A long time supporter of the Ukrainian Bandurist Chorus, I worked with the Kapella on their most recent recording, Brothers! We Shall Live! and was honoured to collaborate on the promotional materials for this concert. And… I have three other very important reasons to be excited for this event: my two sons, and my father. At seven and three years of age, my sons happen to be some of Ruslana’s biggest fans, and love her music just *slightly* less than their grandfather, a baritone in the Chorus. So how incredible is it that they will get to see their Dido perform with Ruslana in a world-class venue!? Pretty awesome. I can only hope that they too will be musically inspired and will some day follow in their Dido’s big red boots and find their place on stage with the Kapella. Visit bandura.org for more information about this event, and where to get tickets. See you there!